Germans, Fawlty. Flaccid Mannschaft fail to make a semi for first time in 12 years. Don’t mention the, the, the….VAR. (© the entire internet and newspaper industry). Curses. I feel dirty. Tried to resist it but the opportunity was so blatant and the open goal so gaping it would have been a crime not to jump on the ‘Don’t cry for me, Argentina’ bandwagon of obvious post-defeat puns. But these are strange times. Wednesday’s action saw Germany finish bottom of their World Cup group after going down to South Korea, Brazil ease through the gears and England preparing for a Group G shoot out with Belgium. And, as ever, there’s a Brentford angle. Of sorts. Just when you thought the World Cup couldn’t get any more exciting, it did. And how! We’ve already seen the likes of Argentina, Portugal and Spain make much harder work of qualifying than they would have been expected to after some quite scintillating group action. Seeded Poland are already out and yesterday afternoon in the biggest of all the shocks, not just for this tournament but in years, Germany were sent home after succumbing 2-0 to South Korea. Talk about a (Joachim) Low point. The defeat saw them finish rock bottom of the qualifying group as, going for broke after Sweden cruised into an unassailable lead against Mexico, it became a case of win or bust. Two late goals – one reinstated thanks to use of VAR and the other with German ‘keeper Manuel Neuer caught upfield – meant this one was left firmly in the bust camp. That totally unusual, and in no way pleasurable, sight of their fans crying in the stands filling our screens. It was just bizarre. Yet at the same time, brilliant. How often have they swept all before them? The ruthless footballing machine that has claimed trophy after trophy. Despatched those crucial penalties with clinical ease? Invincible. Untouchable. All conquering. Until now. These demi-Gods of the global game, brought to their knees. It is the first time in 12 years Germany have failed to reach the semi-final of a major tournament. As many twitter wags have already pointed out, who will now beat England on penalties? More importantly, it has thrown the tournament wide open whilst adding even more intrigue to tonight’s game with Belgium. Specifically, the talk of finishing second being a seemingly more advantageous position to be in. The group winners go into the side of the draw that contains Brazil, Mexico, France, Argentina and Portugal in the knock out stages. The reward for second place is a knockout stage that currently features Spain, Russia, Croatia, Denmark, Sweden and Switzerland. With both sides on level points, goals scored and goal difference, should either fail to win then it will come down to who has the most bookings. At present, a draw will see England will top the pile based on their 2 yellow cards compared to Belgium’s 3. The BBC show how tight the group is. Watching last night’s Brazil game on ITV, the subsequent panel discussion was all around this very point. Gary Neville and Ian Wright both stressing the benefits of the so called easier route (whilst failing to note that it also includes Henrik Dalsgaard of Brentford and his Denmark team. I DID say it was an angle, of sorts). Let the big boys knock each other out. It is an option seemingly favoured by Belgian coach Roberto Martinez. His own interview suggested wholesale changes were in the offing and players protected. Unless my ears were deceiving me, I could have sworn his interview on ITV included references to it being what he deemed “A celebration game” where “the priority is not to win”. All I’ll say on the subject is that at 8/5 this morning, a price checked with my online bookmaker purely for research purposes, England would seem to be very generous price. Then again, could it all be the ultimate in double bluffs from Martinez? Or is the safe and easy route against supposedly easier opposition, one they favoured in their own warm up games for the tournament, something that Belgium will look to try and follow once more. Whilst one can’t imagine they’ll go out of their way to lose / throw the game, perhaps a cagey bore draw is all we have to look forward to. And if this is how things are looking as we head into the final fifteen, could there be a flourish of yellow cards? A bit of back chat here. A ball thrown away there. Just enough to ensure one team tip themselves into second place whilst remaining undefeated. Then again, and has been said many times, yours truly is just the numpty on the terrace. Plenty of questions and no actual answers. Yet. I can’t wait until 7(seven) pm when we find out what they are. PS Just a reminder that The Last Word season Reviews are now available for download. All proceeds from any sales will go to the Brentford FC Community Sports Trust. For less than the cost of a half / pint respectively, they may help while away some time on the commute, by the pool on holiday or just in the bathroom. Who knows? It will certainly do some good for the Trust, whose work has been well documented at Griffin Park but you can read all about it on their site. Plus, pick one up before the end of June and go into the draw to win an exclusive Brentford shirt. PLEASE DM/tweet me (@NickBruzon) a copy of your download confirmation mail and I’ll add your name to the list before an independent adjudicator will select a random Bees fan to win this on July 1st. The Kindle e-book Ten Times Better. Brentford FC Season review: 2017/18. Inspired by ‘that’ interview it contains the least bad of these columns in one, handy volume as it looks at our own campaign as well as wider divisional life and the promotion / relegation races. As a bonus there’s a whole host of new material. New that is, for my pages. Specifically, all the programme articles submitted (both home and away where, if nothing else, you can get the original versions of both Birmingham City and Millwall). Relive the memories. See how often the same material gets regurgitated. Remind yourself how it all began…. We don’t do the serious stuff on these pages. It’s normally just a bit of nonsense about Brentford, perhaps with a bit of the national team thrown in. With Euro 2016 alive and kicking (quite literally) I couldn’t bring myself to do it yesterday. The scenes from the Russia fans and the attacks on England supporters, with the obvious and somewhat familiar retaliation, have left a rather sick feeling in the stomach. More to the point, I’m not there. Who to believe? What to believe? A vile English minority or self-defence? The media have been quick to jump on the England hooligans ‘shaming a nation’ bandwagon. Perhaps true, to an extent, but the more you read the more it sounds a bit different this time. Gangs of French ultras roaming the streets starting unprovoked attacks on those English fans they’ve targeted. Russian thuggery. A flare gun fired at England supporters during the 1-1 draw on Saturday night (there was a game, by the way). A flare gun? Amid all the terror alerts and security. After all the violence. How on earth do you get a gun of any description into a stadium? All in all , whoever you believe to be at fault, some pretty depressing scenes and thought provoking stuff. Thankfully, for us Brentford fans we have our two ‘inside men’ on the scene. Billy Grant and Dave Lane from Beesotted are out in France, trying to enjoy the football but also doing their domestic thing, continental style. Armed with nothing more than a selfie stick, a camera and a laptop they are keeping the website running and bringing us regular reports on what is really going on. And there are some pretty shocking scenes. Great work , chaps. Please keep it up. Here’s hoping you’ve got a happier story to report soon. And in the meantime, for those who haven’t seen it their update on the trouble in Marseille is here. The video is close to a million hits already. Understandably so. So what else have we learned so far? Never shake hands with Joachim Low. He was caught doing the old ‘scratch and sniff’ during last night’s Germany v Ukraine. A game the Germans took 2-0, for the record. Did the Ukraine manager shake hands at full time? Will Grigg isn’t on fire. Despite being one of several ex-Bees involved in the Poland – Northern Ireland squads, the Poles ran out 1-0 winners. And it seems that Stuart Dallas hasn’t got the memo about #Beardclub having been disbanded. He’s looking less hipster and more Rasputin these days. Tonight sees the first chance of that classic tournament line, “And for those of you just coming in from work, the score is…” being trotted out. The game : Republic of Ireland v Sweden. the place: BBC1. Expect that to be used at about 6.15pm tonight . Despite the score being clearly available in the top left hand corner of the screen . As for Brentford news, well the tumbleweed continues. The most I can do is guide you towards eBay where there are a number of unusual Bees shirts on sale at the moment (and none of which this kit nerd will be bidding for on pain of death – not literally, but season tickets don’t pay for themselves). Alternatively,The Last Word ‘season review’ : Ready. Steady. Go Again and the three year anthology : The Bees are going up remain available for download. Should anybody want to go over this nonsense, relive these moments once more and remind ourselves of the pain induced by Stroud and the fallout from that penalty’ you can do so now. It has been a stunning few years. Here’s to more of the same. We may have had a few lows (something about a penalty, the football village, the FA Cup, the pitch, the Marinus experiment) but there have been plenty more highs as the Bees made an unexpected challenge for the Premier League. Could Gibraltar – Germany see the biggest upset since records began? Whilst I would imagine most Brentford eyes are going to be on Stuart Dallas and Northern Ireland’s attempt to beat group leaders Romania in the Euro qualifiers tonight, there is an alternative. And in one of football’s most unlikely yet romantic fixtures, it sees Gibraltar entertain Germany in Group D.
I talked about Gibraltar many times last season (all of which are in the 2014/15 review) with the reverse fixture in Germany, back in November, being one of the highlights. Despite Liam Walker almost scoring a stunner for the boys from the Rock with a dipping shot from 35 yards that left Manuel Neuer furiously backpedalling to just beat out for a corner, the World Champions eventually ran out 4-0 victors. 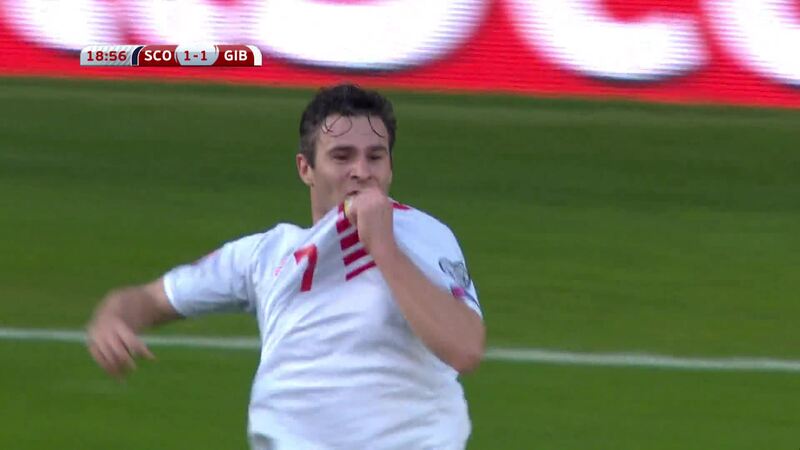 Gibraltar come close to one of the goals, and shocks, of the season. Instead he was left to rue coming up against a resolute opposition as he was forced to admit, “We wanted to play as world champions and four goals are too few”. 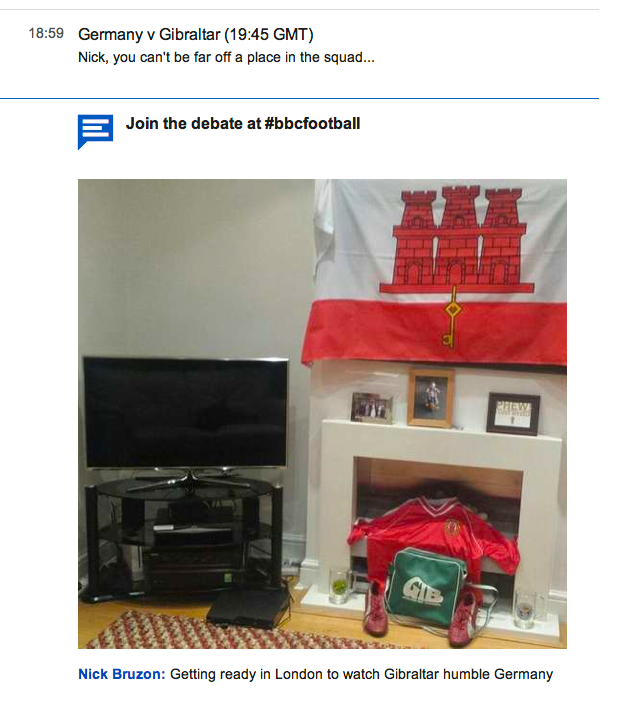 Things have moved on for Gibraltar since that night. They’ve already dropped the bracketings that saw their opening qualifiers end in 7(seven)-0 defeats whilst, last time out against Scotland, they scored their first international goal as Lee Casciaro levelled things up 18 minutes into the game. Whilst Scotland went on to win, things are definitely improving on the pitch for European football’s newest member. So what does it mean for tonight? Well, Joachim Löw was certainly a lot more understated about his team’s chances than last time out in the final press conference before the game. Acknowledging that, “The matches against Australia and USA proved that there is a means of killing our game early on, which makes it hard for us.” has he given Gibraltar a clue about the approach they should take? For me, it is another ‘nothing to lose’ chance for this team to find their feet on the international stage. Löw was honest enough to admit that last time out, “It wasn’t an easy game. They’re tactically astute and we found it tough for long periods” before going on to hope that Germany “score lots of goals”. So – strangle the game, and catch them on the break. Indeed, the pressure of knowing that not only do they need to win, but win heavily, can do strange things to a team currently fighting it out with Scotland for second and third place. The difference between automatic qualification for the finals and play off against, potentially, Netherlands or Ukraine is a huge one. Could it happen for Gibraltar tonight? It would be the biggest upset since records began but then I said something similar last time out. Probably. One thing’s for sure, they’ll be giving it their all and will have an entire nation behind them. I just wonder how far the tentacles of Matthew Benham’s statistical model reach? Tonight Sky Sports 5; tomorrow Griffin Park? You never know…. 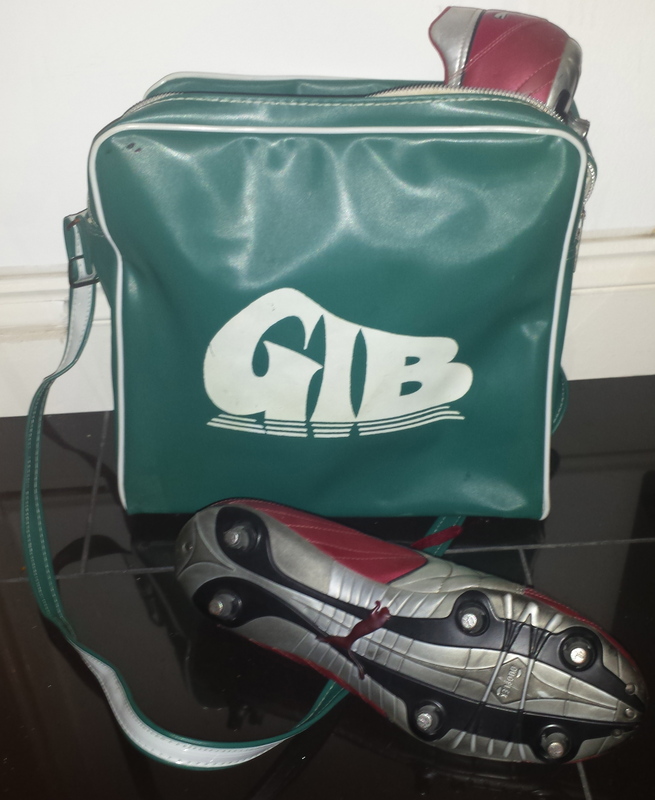 Gibraltar have packed their boots.What about the defensive wall? Well that was unexpected. Gibraltar travelled to Germany and more than held their own against the World Champions in Friday’s EURO 2016 qualifier. With the German fans prepping their calculators and leafing through the record books in anticipation of a goal fest, they were left more than disappointed after limping to a 4-0 win. To read the rest of this article, season 2014/15 is now available to download onto Kindle (and other electronic reading device) in full. Containing additional material and even some (poor) editing, you can get it here for less than the cost of a Griffin Park matchday programme or Balti Pie. Thanks for reading and all your comments over the course of the season. For now, I need to make more space on the site for any follow up. However, ‘close season’ will continue in full, further along. Will over confidence from Germany be fatal v Gibraltar? Today is the day. With Brentford v Fulham still a week away, there can be only one place my attention is focused – Nuremberg, Germany where Gibraltar attempt the impossible. Beating the World Champions in their own back yard.